I did it last year, and I've done it again this year. I'll do it again next year and that makes it a tradition and part of Blog Blast. So yeah, I made a graphic for it. 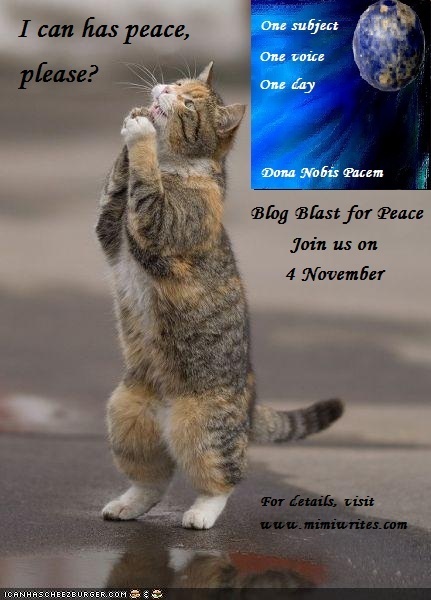 I've been counting down the days to this year's Blog Blast for Peace with peace quotes. Here is a recap of the quotes I chose. "Nobody can hurt me without my permission." Mahatma Gandhi. "Diversity need not be divisive." I don't know if anyone has been formally credited with saying this, but I say it so I'll call it my quote. I hope to see all of your fantastic Peace Globes and read your thoughtful words about Peace. Amazing...I have not been as involved this year as in years past. You should be proud. I must have missed this post in the frenzy of BlogBlast. Awesome to see them in one post. I love it! This graphic is a separate peace globe (#2402)in the gallery and has also been placed in the sidebar as a special link. Thank you!! !